Researchers have dated what is arguably the longest, most impressive rock art sequence found anywhere in the world, in the northwest Kimberley of Western Australia, which could potentially challenge Western Europe as the location for the production of the world’s earliest rock art. Lead Author and Archaeologist from the University of New England, Dr June Ross says the new timeline for the emergence of rock art in Sulawesi in Indonesia at around 39,000 years ago, together with evidence from recent excavations in the northwest Kimberley show that humans with sophisticated artistic skills settled along the northern coastline as early as 36,000 years ago. “Dating Kimberley rock art remains the greatest obstacle to be addressed if the significance of the assemblage is to be recognised on the world stage,” said Archeologist Dr Ross. Dr Ross worked alongside researchers from Macquarie University and the University of Wollongong, as well as Aboriginal Traditional Owners based in Kandiwal and Kalumburu on the collaborative Australian Research Council project. The team aimed to document, analyse and date the wealth of Kimberley art across the region. Focused on the rugged Lawley and Mitchell river basins, team members recorded more than 200 sites over a three-year period, providing a broad platform from which to establish the antiquity of the art. 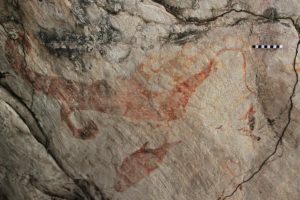 Researchers trialed three different dating techniques on a range of rock art styles. The most successful technique proved to be a light sensitive dating method called optically-stimulated luminescence (OSL), which was applied to the sand grains found within mud wasp nests, which adhere to many of the art motifs and become fossilised over time, creating a type of time capsule. As OSL measures the period of time since the grain of sand was last exposed to sunlight, the resulting age records the time when the nest was built on top of the painting, thus providing a minimum estimate for the time that the artist could have painted the image. This method provided nine ‘minimum’ age estimates for mud wasp nests overlying art. Another technique, Accelerator Mass Spectrometry radiocarbon (AMS 14C) dating, applied to the carbon within the wasp nests, and to beeswax spots found adhering to the art, provided an additional four results. “Mud wasps really are the most helpful insects, they build nests on top of the art using grains of sand that can be used for dating without damaging the art itself. As long as we understand how the nests are constructed and how well they’re preserved over thousands of years, we can use the resulting age to confidently claim that the artist painted this image before the mud wasp constructed its nest,” said Geochronologist, Dr Kira Westaway from Macquarie University. OSL results confirm that the origin of the northwest Kimberley rock art assemblage is indeed ancient providing evidence that art was being painted just after the height of the last glaciation. “The oldest age we established during the project was not for a classic example of Gwion style rock art as we had hoped, ” said Dr Ross. As a pioneering citizen science approach to rock art research in the Kimberley region, 20 Aboriginal community members from Kandiwal and Kalumburu participated in the project playing a central role in developing sampling strategies and ensuring sampling procedures were non-destructive. The late Albert Bundamarra stated at the completion of the 2012 field season that the project had provided the opportunity for his family and other community members to re-connect with country and had given the young people, like his son, Albert Jnr. an opportunity to visit sites for the first time, to learn old traditions and develop new skills. OSL results confirm that the origin of the northwest Kimberley rock art assemblage is ancient, providing evidence that art was being painted just after the height of the last glaciation. “A perfectly preserved, yam-like motif painted in mulberry coloured ochre on the ceiling of a deep cavern returned a minimum age estimate of more than 16,000 years. The oldest age we established during the project was not for a classic example of Gwion style rock art as we had hoped,” said Dr Ross. 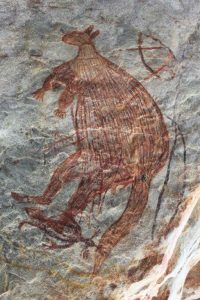 Commenting on the dating results, Cathy Goonack, Chair of the Wunambal Gaambera Aboriginal Corporation stated that “our rock art brings visitors from all around Australia, and around the world, to the Mitchell Plateau. They want to look at our art and hear our stories; now we’ve got a good science story that we can tell people as well. We’ll also use this information to help us look after our art”.